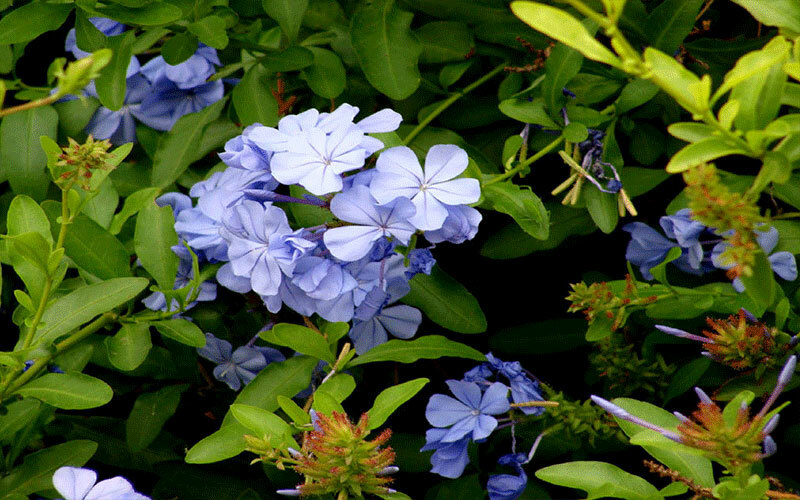 A blue flowering plant is a rarity in South Florida landscapes, and blue plumbago plays well with others flowering plants. It's especially nice combined with other plants with silvery foliage and those with pink, yellow or white flowers. There's even a lesser-known white plumbago. The flowers resemble those of phlox, and the petals are slightly sticky (like Post-It Notes). Break up the soil before planting using a pitchfork or spade. 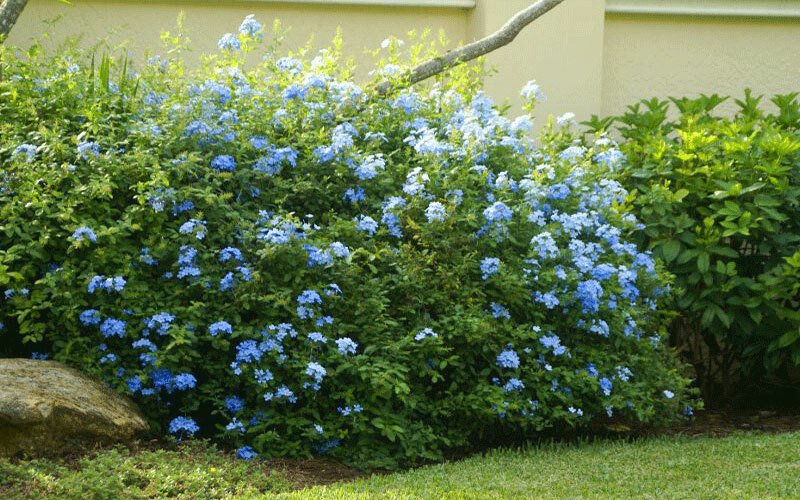 Dig holes for the blue plumbago that match the height and width of their nursery containers, using a hand shovel. Space each hole 2 to 4 feet apart. Remove the plants from the containers and set one in the center of each hole. Back fill the holes and pat the soil down around each plant using your hands. This will remove air trapped within the soil that can rob the plants of moisture. Water the blue plumbago generously after planting, soaking the soil to a depth of 1 inch using a garden hose. Continue to provide supplemental watering at a rate of 1 inch per week throughout the growing season. When trimming the plant or brushing by it expect to find little blue flower petals clinging to your skin or clothing. The plumbago plant has a spreading, rambling habit that works best in an informal, naturalized setting, cottage garden or English garden style landscape design. 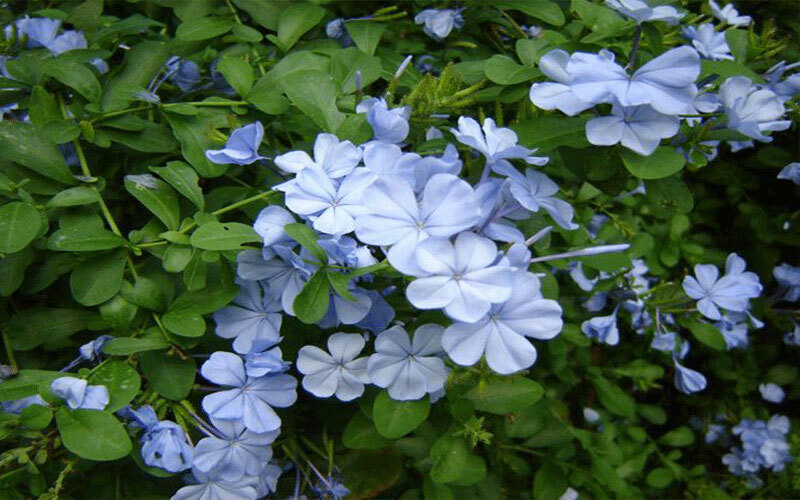 Feed your blue plumbago a diet of balanced fertilizer. Follow the label instructions for application methods and allocation amounts. 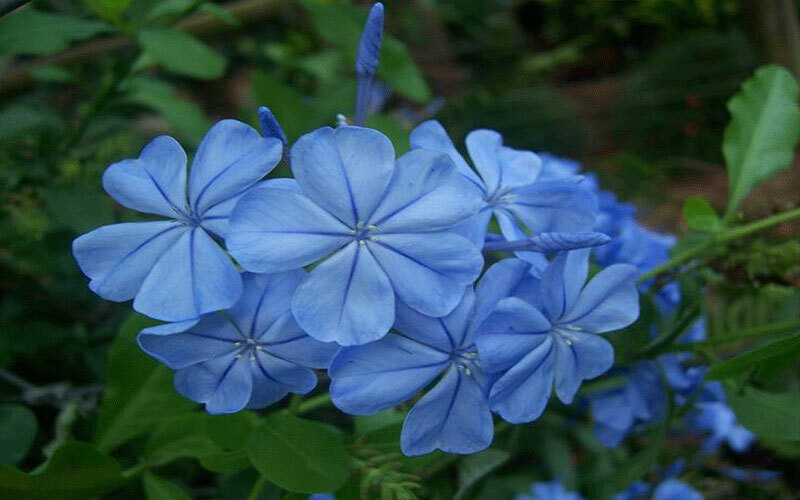 Most blue plumbago plants benefit from bi-weekly fertilizing. This evergreen shrub is a fast grower that blooms on and off all year more in warmer weather. It needs full to part sun to flower to perfection.